Since I know a bit about Viznitz let me give some context to the pictures you present. Historically Viznitzer chasidim who lived in Maramoresh made their anual trek over the mountains to be Rosh Hashana in Viznitz. Those treks by foot usually took 2 to four weeks of walking thru woods and enormous peaks during Chodesh Elul, they are legendary and are an integral part of Viznitz story telling and Maramoresh culture in general. 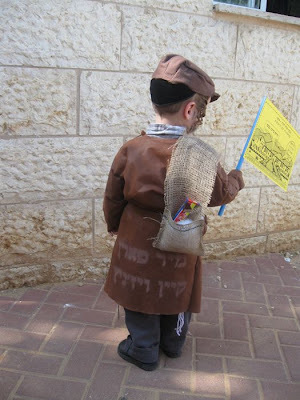 These kids are wearing a symbolic representation of סאקוועס "sakves" a sort of backpack with only poor-mans-bread, called Mamalige or Korsh and little bit of Mashke as צדה לדרך. I knew one person in Boro Park who participated as a kid with a whole group of chasidim for 2 weeks in such a trek in 1929? the last time Reb Yisrol'tche Viznitzer celebrated Rosh Hashana in his home town Viznitz. I myself heard Reb Moshe'ele the Rebbe of Viznitz describe the scene of hundreds of little lantern carrying men with "sakves on their pleitze" descending in middle of the night before slichos erev Rosh Hashana quietly down the mountainside with so much emotion, and when they arrived in the Rebbe's court many of them kissed the ground of the Rebbe's shul. Of course the more enlightened Bukovina Chasidim "oifgeklerte" poked fun of those "poshete" אמונה פשוטה אידען who behaved with such unbridled fervor and were called "Sakves Yidden". They in turn were proud of that term. 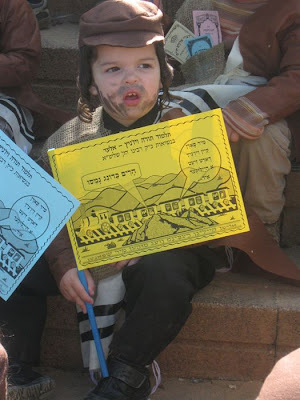 These children in these pics are being taught in a Viznitzer Cheder about those chasidim. Of course to my mind those things are nontransferable, they are unfortunately just a memory that spiritually can't be transplanted in the land of Cactus and Sand [ooops milk and honey] Still, just like in Chabad its sort of a yichus to say; my grandfather is a Tomim from Otvotsk or for a Sqverer to say: My zaide is from the Ukraine [c"v not from Ungarn] in Viznitz it's big deal if your Zeide made his way to Viznitz by foot over the mountains with Sakves over his shoulders. So here me too: My Zaide made that trek. Since I know a bit about Viznitz let me give some context to the pictures you present. Historically Viznitzer chasidim who lived in Maramoresh made their anual trek over the mountains to be Rosh Hashana in Viznitz. Those treks by foot usually took 2 to four weeks of walking thru woods and enormous peaks during Chodesh Elul, they are legendary and are an integral part of Viznitz story telling and Maramoresh culture in general. 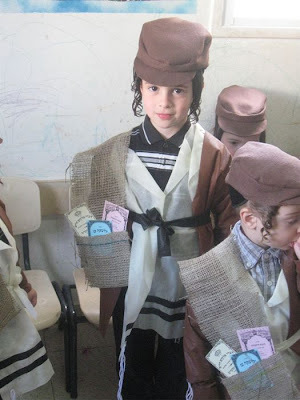 These kids are wearing a symbolic representation of סאקוועס "sakves" a sort of backpack with only poor-mans-bread, called Mamalige or Korsh and little bit of Mashke as צדה לדרך. I knew one person in Boro Park who participated as a kid with a whole group of chasidim for 2 weeks in such a trek in 1929? the last time Reb Yistroltche Viznitz celebrated Rosh Hashana in his home town Viznitz. I myself heard Reb Moshe'ele the Rebbe of Viznitz describe the scene of hundreds of little lantern carrying men with "sakves on their pleitze" descending in middle of the night before slichos erev Rosh Hashana quietly down the mountainside with so much emotion, and when they arrived in the Rebbe's court many of them kissed the ground of the Rebbe's shul. Of course the more enlightened Bukovina Chasidim "oifgeklerte" poked fun of those "poshete" אמונה פשוטה אידען. Who behaved with such unbridled fervor; and were called "Sakves Yidden". They in turn were proud of that term. Still just like in chabad its sort of a yichus to say; my grandfather is a Tomim from Otvotsk or for a Sqverer to say; My zaidy is from the Ukraine [c"v not from ungaarn] in Viznitz its big deal if your Zeidy made his way to Viznitz by foot over the mountains with Sakves over his shoulders. So here me too: My Zaidy made that trek. 2) You know what I liked about that post, especially with the updated explanation you took from the comments? It told me something I never knew before. What's more: I didn't know that I didn't know it. That's another level of chiddush for which I am always grateful. Thank you. 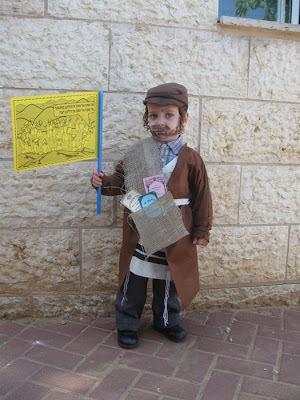 my question to yosef 718 Is this training the childern to Hikashres? or to? Zicher- great comment, thanks for pointing out the thing with Rav Ovadya. I just want an answer ?! Land of Cactus and Sand? Today's Holy Land Promised by Hashem is Monsey for Viznitz chassidim? was referring to the attempt of trying to 'teach' children about trekking snow capped fearsome peaks with nothing more than a back pack and the night stars gaze at. Sand and Cactus is about geography not about holiness. Think of what it is like to light Chanukah candles in Australia in summer camp. Then telling your grandchildren how he used to light the candles in front of frost covered windows and eating hot latkes. BTW: do you eat hot potato latkes in the 3 weeks or is it ice cream pecan that you desire while cooling off in your shorts. How about this without a reason is it true you only Klop by HAMAN BEN HAMDASAH It is a Yes or no question? I checked the Halacha Sefer I saw no mention of it. The Chabad custom is to make noise at Haman's name only when he's mentioned with a title. The Ba'al Koreh should wait for silence before continuing. ס"ה maybe 8 or 9 times, not 55. Makes it easier for everybody. Is that the reason then Genius-I thought it was a Hechere Zach reason if not Can I get a reason or A link of where i can find a reason? In Hatomim it says something to the point that now that we are in Golus - Lubavitch is our Jerusalem, the Rebbe's Shul is our Beis Hamikdash and the Rebbe's room is our Kodesh Hakadoshim . . .
Mottel Are you Adressing my question? It was meant for Akiva really . . . but if it answers your Haman questions . . .